This is the first review on This Is Darkness by Przemyslaw Murzyn known for his respected and well-revered zine, Santa Sangre! I stumbled upon this very cool sounding name quite often, on the occasion of various splits, collaborations, compilations or live show announcements on social media. So I have to admit, I was a bit surprised when I realized that Liquid Circuits is only the second album by this project run by Zhelezobeton label manager. Second album in 12 years – who would’ve thought? So I guess we should expect something epic – a creme de la creme of all Artyom’s ideas that had been born in his mind during all those years. I’m guessing it might be the essence of his creativity, as the album is quite huge in all possible aspects: its duration, production, atmosphere and the abundance of used sounds and effects. At the same time, it is representative of the Russian industrial scene and their cherishing of analogue synths and the meaty, natural form of the sounds instead of purely digital output. Check the booklet and the technical specification of Liquid Circuits to see in detail what kind of equipment Artyom has used. 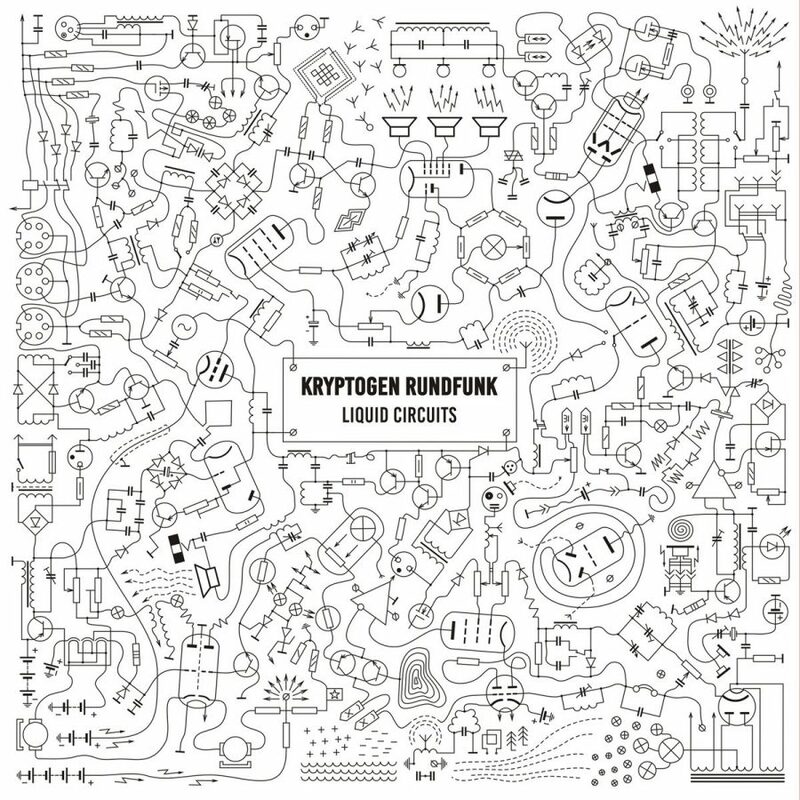 Kryptogen Rundfunk music is hard to classify because several musical fascinations are playing an equal role here. It is experimental, because even for a not very experienced listener it seems obvious that the artist is often improvising and checking the possibilities of the equipment and the sound forms it is able to create. It is industrial perhaps even “dark” industrial thanks to the machinesque and soulless feeling. The rhythmic pulsations, hums, diverse noises, radio waves make you feel like you’re inside a giant electric device or installation full of – not necessarily liquid – circuits, coils and resistors. Its purpose is still to be determined, but it doesn’t include a human factor in any aspect. More in the background you’ll notice a few dark ambient inclinations as sometimes the sounds take a more drone-like shape, like for example in the third track, “Pyramidoid”. The drones and textures are also filling the holes in the composition structures, they’re like concrete which bonds the whole thing into one monolithic construction. And on top of that a pinch of noise, not very aggressive, just underlining the cold and mechanical character of the album, having no ideology, no message to the people, which in this case is so unnecessary. Unless you consider the immersion with the music literally and feel that your soul is merging with the integrated circuits making one half-organic, half-artificial entity. After all, who knows if it isn’t the future of humanity. Something of which we should all be afraid. So is it a unique album? By all means no, we were drowning in these atmospheres a lot of times in the past. But at the same time, Liquid Circuits gives a whole lot of listening pleasure as it is a well prepared dish for all the connoisseurs of honest, quite old-school industry devoid of useless flashiness.